The mobile giant, Samsung has launched its new budget Smartphone Galaxy J1 in the market, which is sure to give a tough competition to budget phone from Micromax, Xiaomi, Intex, etc. Priced at Rs. 7,190, this phone has been equipped with good features and functionalities. This is a dual-SIM phone, which is sure to cater to the needs of buyers on picayune budgets. This phone is precursor of the beginning of an entirely new Samsung Galaxy J series Smartphones. Let us have a closer look at this new Smartphone from Samsung, which has been a leading name in the Smartphone market. 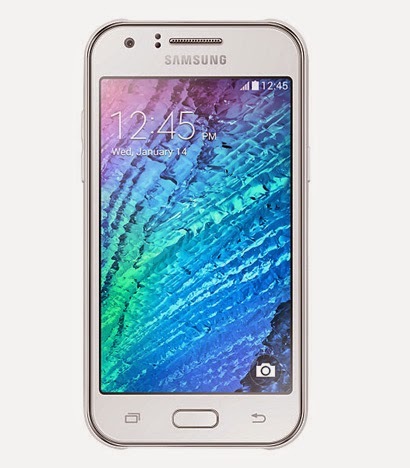 The Samsung Galaxy J1 comes with same design as all Galaxy Smartphones. It has a slim profile with rounded edges and is only 8.9 mm thick, which not only lends a classy look but also makes it easy to hold. It weighs only 130, which is definitely light weight and is available in three colors; White, black and blue. This entry-level Smartphone features a 4.3 inch WVGA display with a screen resolution of 480x800 pixels. The screen has a pixel density of 217 ppi and supports wide variety of colors. The display comes with multi-touch features along with proximity sensor and light sensor. This phone offers good viewing angle and bright colors, which is quite decent to watch videos as well as images. The phone is powered by a 1.2GHz Dual-Core Processor, which is supported by 512 MB RAM. The processor and the low RAM provides a little glitch in the smooth performance of the phone. However, as compared to other phones from other companies that come with the same price tag, the performance of this phone is quite decent. The phone has an internal memory of 4GB, which is expandable up to 128 GB using micro SD, micro SDHC or micro SDXC cards. It is equipped with Android Kitkat 4.4 operating system, which supports myriad of applications that are available in Android app store. It also supports JAVA through Java MIDP emulator. Camera has become a compulsory feature for every mobile phone and even this phone boasts of a 5 MP primary camera with CMOS sensor that supports 2592 x 1944 pixels resolution. It also comes with an LED flash, which allows you to capture images even in low-light conditions. Besides this, the phone also enables video recording, which supports a resolution of 720p at a frame rate of 30 per second (30fps). The camera comes with Geotagging feature, which enables users to add location and time to the images taken. Touch focus, Smile detection, Exposure compensation, ISO control, White balance presets, Panorama, Night mode, Effects, Self-timer and face detection are the other features of this phone. To enable video calling and taking selfie, this phone also sports a 2 MP front-facing camera. The images taken by this phone is of decent quality even in low-light conditions. The Galaxy J1 supports 3G network, which allows its user to surf Internet faster. Besides this, the phone supports Wi-Fi (802.11 a/b/g/n), which allows connecting to wireless network and for data transfer to compatible devices, it has Bluetooth: 4.0(BLE) and microUSB. It also supports ATN+ and GPS (A-GPS/ GLONASS), which makes this phone quite useful. It supports video playback having H.263, H.264(AVC), MPEG4, VP8, VC-1, Sorenson Spark, MP43, WMV7 and WMV8 extensions. For audio playback, it supports MP3, AAC/AAC+/eAAC+, WMA, AMR-NB/WB, FLAC, Vorbis(OGG) and WAV. The phone comes pre-installed with Google Mobile Service Chrome, Drive, Photos, Gmail, Google, Google+, Google Settings, Hangouts, Maps, Play Books, Play Games, Play Newsstand, Play Movie & TV, Play Music, Play Store, Voice Search and YouTube. Some of the additional features are Ultra Power Saving Mode, Changeable Theme (Natural, Classic, Casual, Romantic), Private Mode, Multiscreen and Quick Connect. Definitely, this phone comes with amazing up to date features, which is sure to grab the attention of Samsung Loyalists. Samsung phones are well-known for its amazing battery backup and the new Galaxy J1 will not disappoint the users as it is powered by 1859 mAh battery. It offers a talktime of 10 hours on 3G network with as single charge and Web browsing time up to 9 hours, which is quite good. However, with for those who have lesser usage, the battery can lasts for more than one day with a single charge. After witnessing all the features and functionalities of the new Galaxy J1 by Samsung, it can be concluded that this phone is quite impressive as an entry-level phone. It comes with great features, good performance, powerful battery and decent cameras, which is quite amazing as compared to the phones at the same range. In terms of design, this phone looks classy and have a good display, which makes it worth buying, especially for those who wants a feature-rich phone at a low cost.